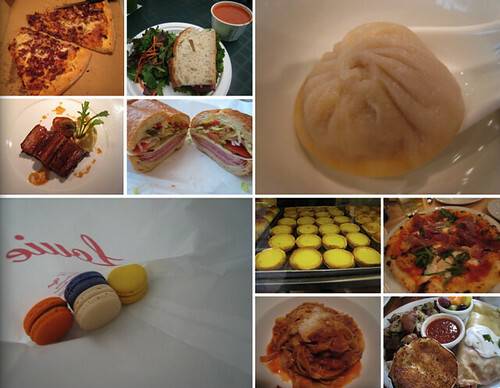 This Foodie's Life: A food blog: Hello 2010! 2009 was a great year spent with friends and family and, of course, a year filled with good eats! I found good food wherever I was - from chasing down food trucks in LA, to trying Mofongos in Puerto Rico, dinning at Joel Robuchon’s L’atelier in Las Vegas, waiting in line for soup dumplings in Shanghai, and eating egg tarts in Hong Kong. Things will only get better in this decade and 2010 will be filled with more exciting foodie adventures! Recently, I have freed up some time by single-handedly bringing down the ratings of Heroes, Private Practice, Community and The Big Bang Theory by breaking up with them on my DVR. To fill the void, I will be more committed to my food blog. My goal in 2010 is to post a restaurant review or recipe once a week. Keep a look out! Cheers to a year filled with great food, fun adventures and amazing times with friends and family! Thank you for this blog for help to make me delicious food.